The 2014 SUP 11 City Tour is DONE. And what a crazy adventure it was. Congratulations to Bart de Zwart for reclaiming your crown and showing you’re still the king of endurance paddling. That was a truly inspiring performance and one that I was stoked to see first hand. Fighting performance from the ever-smiling Peter Bartl, however as much as he tried, the defending champ just couldn’t shake Bart. Great effort by Martjin van Deth as well, who hung on for just about every one of the 200kms, despite the crazy pace that Bart and Bartl were going along at. Also special mention to Arnaud Frennet from Chile, who won the Non Stop Tour division in a ridiculously fast time of 26 hours, 20 minutes. 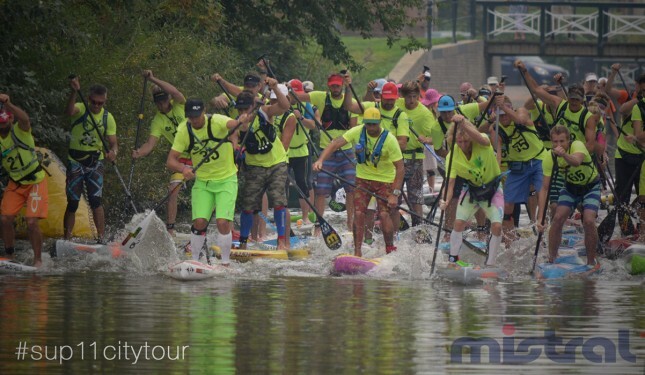 There were 10 competitors who literally paddled the entire course non-stop. And I thought the five day race was hard. Great effort from Janneke Smits in the women’s division, taking all five stage wins to claim her maiden 11 cities title. Thanks to Mistral SUP for the support to make this voyage happen. Awesome job by Steve West and wife Mandy (as well as @thegirlfromsupanema) for following me every day, taking great pics and cheering loudly from the bridges when I was struggling to hang on. Scroll further down to relive the week-long live blog, including daily recaps and photo highlights. Here are the results from the competition divisions (apologies to the 70 odd paddlers in the non-competition divisions, don’t have your times yet).